Blick's moist stoneware clay is a ready-to-use, de-aired, homogenous mixture that requires little or no wedging. Its smooth, plastic consistency makes it excellent for throwing as well as modeling, coiling, and slab building. This stoneware clay is ideal for making durable dishes, sculpture, planters, patio vases, and other utility and decorative ware. Bisque fire to Cone 04 (1971°F, 1077°C). The firing range is Cone 5–10 (2205°F–2381°F). When fired at the recommended temperature of Cone 5 (2205°F), the hard, dense, semi-vitreous ware is buff colored with a shrinkage of 12% and absorption of 1.8%. At Cone 10 (2381°F), the very dense, vitreous ware is a soft gray color with a shrinkage of 13.2% and absorption of 0%. 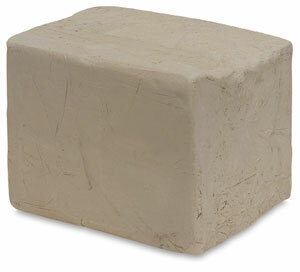 A 50 lb (23 kg) carton consists of two 25 lb bricks, each in a poly storage bag, so any amount can be used as required and the rest stored for future use.